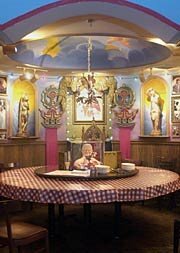 I forgot to take my camera with me to dinner on Thursday night, but here is a small photo of the Pope room in Buca di Beppo's, where Keith's manager, Russ, and all the other guys from his team brought us for dinner on Thursday night. It was your typical nerdy Italian dinner. We spilled food on the table and talked about beards. But no-one could escape the beady eyes of Pope Benedict in the centre of the table on the lazy susan, turning slowly and sweeping the table with his beams of holiness. 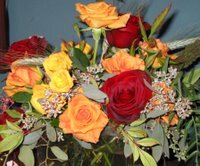 When we left, Russ gave us these lovely flowers as a present for our wedding. Bloody Googlers. They're just so nice.